A focus group discussion on menstrual hygiene at a slum in Om Sakthi Nagar in Tamil Nadu’s southern district of Coimbatore. The shame and secrecy around menstruation ensures that women don’t follow hygienic practices, risking urinary tract and vaginal infections. I read this article and found it very interesting, thought it might be something for you. The article is called Most Indian Girls Unprepared For Menstruation, Taboos Drive Unhygienic Practices https://www.indiaspend.com/most-indian-girls-are-unprepared-for-menstruation-taboo-behind-unhygienic-practices/. Chennai: Kala was 11 when she had her first menstrual period. She was at home preparing for her final exams and panicked when she found herself bleeding. “My first reaction was to panic,” recalled Kala (name changed to protect identity), a college student in southern Tamil Nadu’s Coimbatore district. “I thought I had contracted some serious illness and I was going to die. What would happen to my exams? Should I ask my father to take me to the doctor?” Kala had called out to her mother in panic. ”My mother did not come,” Kala said. Instead, the old woman who lived next door did. “After bustling about and getting me to bathe, she took me to a room near the cowshed, asked me to sit on a wooden plank, which had already been prepared for me and asked me not to move from there,” she said. Kala was given some food and water and left alone. It was evening before she saw her mother. “Instead of comforting me and taking me home, my mother told me that I was a big girl now and that I should stop playing with children in the neighbourhood,” she said. Kala’s story is neither strange nor singular in rural and urban Tamil Nadu, found a study on menstrual hygiene done by the Tamil Nadu Urban Sanitation Support Programme (TNUSSP), which works with the government of Tamil Nadu and is supported by the Indian Institute for Human Settlements, Bengaluru. Ignorance and superstition deprived young girls of crucial information on menstruation and the importance of menstrual hygiene, concluded the study, conducted in two town panchayats near Coimbatore city, Periyanaicken-palayam and Narasimhanaicken-palayam. Young girls were completely unprepared at the onset of menarche, according to the study. Around 84% of the adolescent girls interviewed said they were taken by surprise when they got their first period. Around 60% of women diagnosed with common reproductive tract infections reported poor menstrual hygiene, according to a 2012 United Nations Population Fund study. Only 15% of women use commercial sanitary protection, while 85% use home-made products, according to a 2015 study on menstrual hygiene practices. The interviews for this study revealed that these products range from cloth to make-do pads stuffed with ash, husk or even sand. However, the use of cloth comes with its own set of problems if it is used unhygienically. Often there is not enough water to wash the menstrual cloth, the study found. Even in places where water is in plenty, the secrecy around menstruation does not allow women to wash and dry these cloth bits in the open. Instead, they are dried under other wet clothes, in damp toilets or sometimes even under mattresses. “How can we let everyone know that we have been menstruating?” is the common refrain. Vaginitis and urinary tract infections were twice as prevalent among women who used cloth during menstruation than those who used sanitary pads, according to a 2015 study among 486 women in Odisha. Our visit to the Banagudi tribal colony, around 12 km from Kothagiri in southern Tamil Nadu, revealed a tiny settlement of 49 families. They had been shifted here from Manali Aada 40 years ago by the Nilgiris Adivasi Welfare Association. Menstrual practices here continue to be bound by superstition. This ‘huge information hole’ is prevalent among rural and urban adolescent girls about menstrual hygiene, found a 2014 study. Conversations in Narasimhanaicken-palayam revealed that the situation was no different among married women. Nagaveni (name changed to protect identity), a 26-year-old resident of Balavinayagar Nagar slum, said she would never ask her husband to shop for sanitary napkins. The Tamil Nadu’s government’s Pudhu Yugam (meaning new era in Tamil) scheme for providing free sanitary pads was launched in November 2011 as part of the government’s Menstrual Hygiene Management Programme. It provides 20 sanitary napkins every month to girls in the age group of 11-19 years in rural and peri-urban areas. The scheme has so far covered around 88,000 adolescent girls, but the verdict on the quality of these pads is mixed. Subsidised napkins provided by the Tamil Nadu government under the Pudhu Yugam scheme. These napkins were not of a good quality and were good only for a couple of hours, said local anganwadi workers who play a crucial role in helping adolescent girls understand menstruation. “We prefer to use the store-bought pads. We give these to our mothers,” said one of the girls who participated in the TNUSSP study. Subsidised napkins were not of a good quality and were good only for a couple of hours, said local anganwadi workers who play a crucial role in helping adolescent girls understand menstruation. “It is very difficult for those who are solely dependent on the pads distributed under the scheme,” said Padma (name changed to protect identity), an anganwadi worker from the Om Shakthi Nagar slum in Narasimhanaicken-palayam. Anganwadi centres in slums, which are expected to observe a Village Health Nutrition Day (VHND) every month to increase awareness about antenatal and postnatal care, immunisation, pregnancy, and menstrual hygiene, do not hold these regularly in these districts. “The VHN day was one event where adolescent girls could get accurate information on menstruation and menstrual hygiene,” said one interviewee who did not wish to be named. Menstrual hygiene discussions are incomplete without discussing the disposal of soiled pads. The shame and secrecy associated with menstrual periods result in improper disposal methods. The polymeric sanitary napkins, which have replaced cloth napkins to a great extent, are made of material that is non-biodegradable, leading to the accumulation of used napkins in landfills. 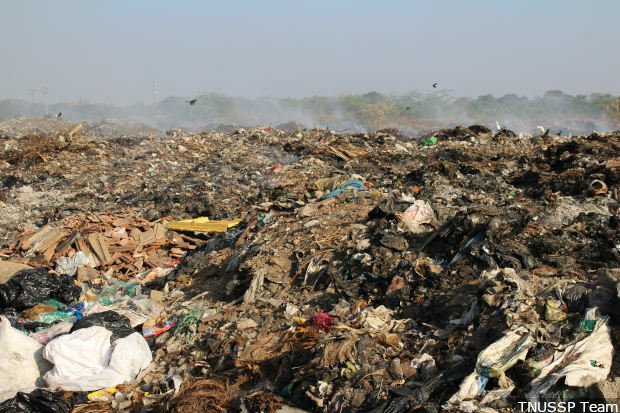 In places like Narasimhanaicken-palayam, the sanitary waste is mixed with all other wastes and is dumped in a landfill 3 km from the town panchayat limits. “This practice has been followed for the last 20 years,” said a resident who chose to stay anonymous. The shame and secrecy associated with menstrual periods result in improper disposal methods. The polymeric sanitary napkins, which have replaced cloth napkins to a great extent, are made of material that is non-biodegradable, leading to the accumulation of used napkins in landfills. There are initiatives by the government’s healthcare machinery to provide sanitary napkins, iron and folic acid tablets and supplements to women and young girls. But there is still shame and secrecy around the subject of female reproductive health and the only way to change this is to involve the family, society and community in menstrual health awareness.